On a national basis, corn and soybean yields were near record-breaking levels in 2018, with exceptional yields in central Illinois and the eastern United States contributing heavily to those near-record U.S. yields. Other areas had below-trend yields. The county yields for corn and soybeans presented in this article illustrate these facts. Much higher U.S. yields are possible if all areas have exceptional yields. However, all areas including Illinois should not expect above-trend yields in every year. 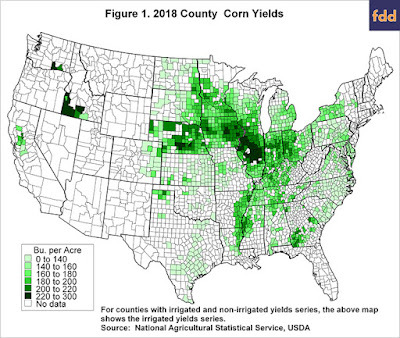 The 2018 corn yield for the United States was 176.4 bushels per acre, just .2 bushels below the record yield of 176.6 bushels per acre set in 2017 (all yields in this article are from QuickStats, a website maintained by the National Agricultural Statistical Service). From a national standpoint, corn yields were excellent in 2018. 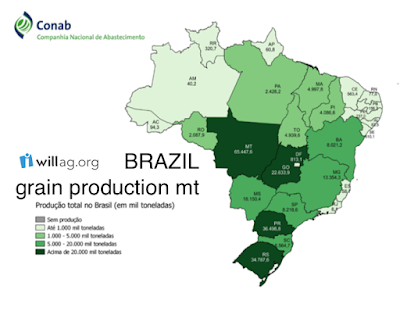 @Conab_Oficial reports Brazil's second-crop corn acreage is expected to be up 6.1% from last year. An early soybean harvest and good weather are the contributing factors. The 2nd crop corn harvest is expected to be 26.4% larger than last season's climate hampered crop. Brazil's 2018/19 ending stocks are expected to rise to 15.3mt or approximately a 2-month supply with total yearly demand at 93.5mt. @Conab_Oficial notes new crop corn supply may yet grow as production conditions are "very positive". Exports are set at 31mt. On price - @Conab_Oficial is concerned domestic usage will not increase because the 62.5mt already includes livestock feed usage that has levelled off and it is not known if domestic corn ethanol increases will materialize as new plants have yet to come online. ...a good part of the 1st crop corn writes @Conab_Oficial has not been marketed. When taken with a big second crop corn harvest it cautions a low price scenario. Friday’s USDA reports surprised the corn market. Todd Gleason has more on how more corn acreage than expected this year coupled with more corn leftover from last year than expected will influence prices. The USDA’s quarterly Grain Stocks report and annual Prospective Planting report delivered surprises to the corn market. A greater than expected corn stocks number combined with higher than expected planted acreage of corn gave very bearish news to corn prices. Soybean stocks and acreage came in neutral to slightly positive for soybean prices. The fall of 2018 and so far in 2019, there have been limited opportunities to apply nitrogen fertilizer. Average rainfall through the first 25 days of March ranged from a little less than normal in the northern half of Illinois to an inch or more above normal in south-central Illinois. But temperatures have averaged 3 to 4 degrees below normal, which slowed drying. There were several days in the first week of March when it was frozen on the surface and a considerable amount of P and K went on. This was followed by an inch or more of rain (which had been forecast) in many areas, and it’s likely that some of the nutrients—those in MAP/DAP and potash are soluble—moved from higher to lower parts of fields, or off of fields altogether. While it’s good to get P and K applied before spring work starts, we really should consider holding off the next time soils are frozen and substantial rainfall is forecast before a thaw. Corn farmers in northern Illinois and across the corn belt have been dealing with a new disease. Todd Gleason has more on Tar Spot and what producers can do to mitigate its impact. Tar spot is a relatively new disease of corn in the Midwest. It has been showing up on field corn in Iowa, Illinois, Michigan, Wisconsin, Indiana, Ohio, and Florida says University of Illinois Extension Plant Pathologist Nathan Kleczewski, "That's where it is found right now. But in terms of severity, where we have seen it the most and the pressure is the highest, if you would take the lower portion of Lake Michigan and draw a section around there, that is where we've had the greatest severity right now. That is where we've had the most pressure." Spring field operations will soon begin, and nitrogen applications on corn will commence. More nitrogen will be applied this spring than is typical because wet weather limited fall applications. 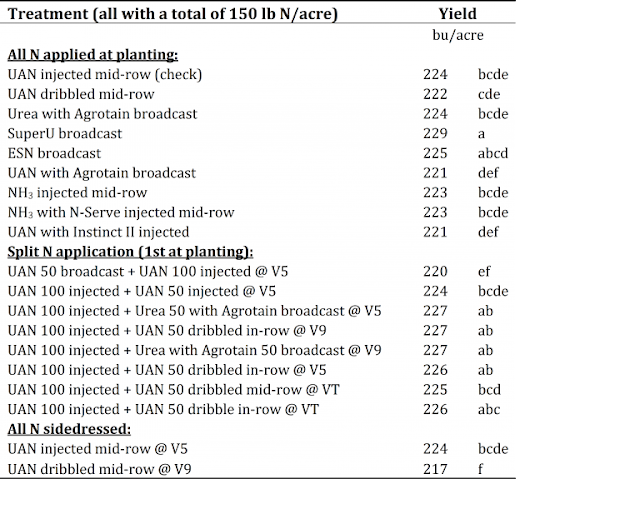 University-recommended nitrogen application rates in Illinois are between 140 and 180 pounds of actual nitrogen per acre for corn-following-soybeans. For farmers applying above those rates, application reductions seem prudent this year. If a farmer is uncomfortable lowering to the University-recommended rates, experimenting by leaving strips in fields seems prudent. 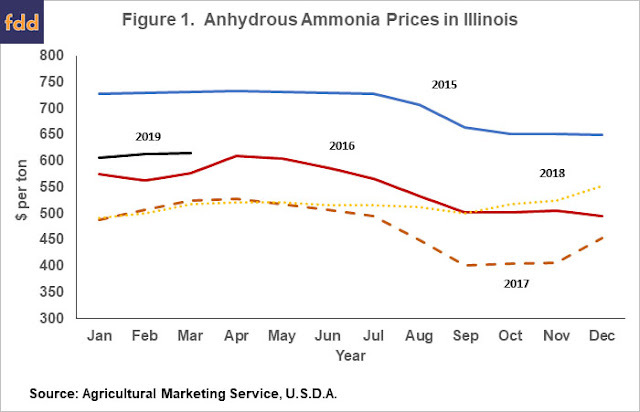 Why Consider Lowering Nitrogen Application Rates in 2019? The agricultural sector is caught up in a storm of change. Political and economic forces have been squeezing trade on the global front and U.S. farmers have been leaning into the winds. We take up a few of these topics in this edition of the WILLAg Newsletter. 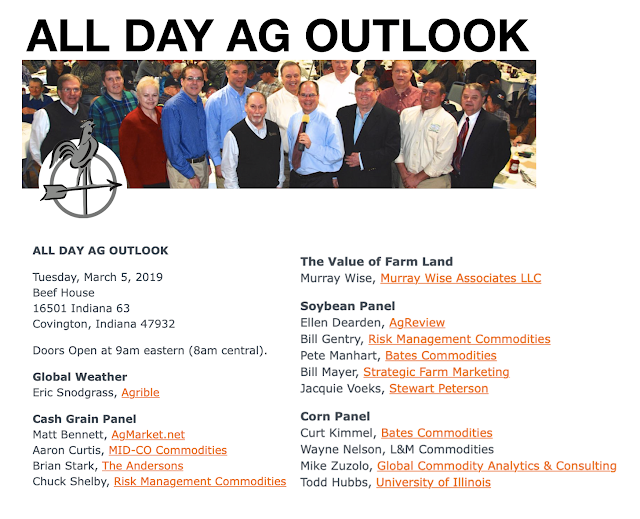 Trade with ChinaProfile of USTR LighthizerUSDA Ag Outlook ForumCorn Acreage in 2019Expected Corn vs Soybean Returns2018 Ethanol Plant Losses We’ll also explore these topics, marketing prospects, the price of farmland, and the weather during our March 5 All Day Ag Outlook. Hopefully, you can join us at the Beef House in Covington, Indiana. The cost is just $30 and includes Beef House coffee and rolls in the morning and Beef House lunch at the noon hour. Tickets are available online or by calling 800–898–1065.